The Mega Man series is famous for its challenging, precise platforming action. 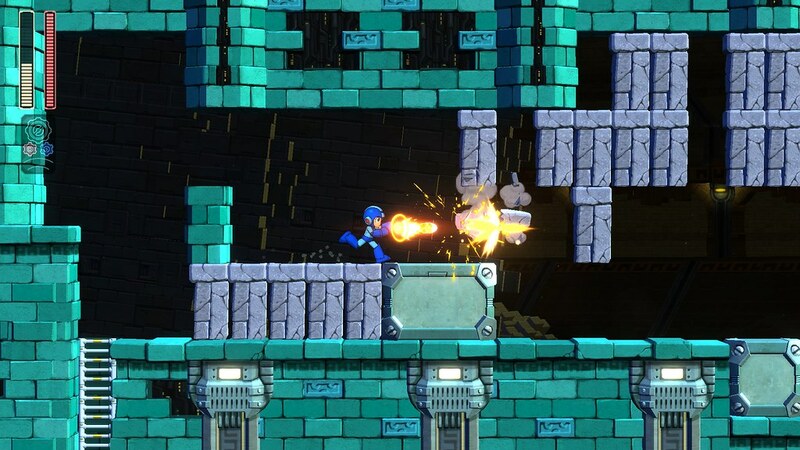 Even though newly accessible difficulty modes are available in Mega Man 11, the game’s default level of challenge requires some finesse. Get ready for perilous pitfalls, treacherous spikes, and Robot Master boss battles that will put your skills to the test. Sometimes we need a little help conquering that first boss to get the momentum going, so I’m here to help you master Mega Man’s new abilities and make it through Block Man’s stage. Speed Gear – Toggling this ability enhances Mega Man’s speed, making him move so fast that it appears as if the world around him has slowed down. In essence, it slows time so that players can better dodge falling blocks, battle quick enemies, and more. Power Gear – This Gear powers up Mega Man’s arm cannon, enabling rapid-fire shots and a double-charge shot blast for huge damage. It also powers up boss weapons, which we’ll cover in a minute. It’s great for battles against the spikey mid-boss in Block Man’s stage and for taking down the Robot Master himself. Be careful about overusing either Gear, as the Double Gear System can overheat and you’ll have to wait for it to cool down before you can use it again. 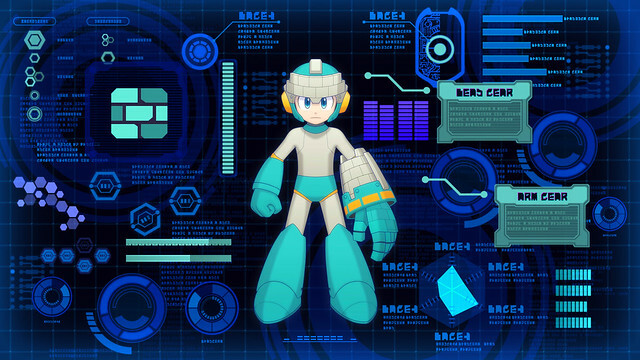 Double Gear Technique – Try pressing R1 + L1 at the same time when Mega Man’s health is critically low to unleash the Blue Bomber’s hidden power. Mega Man will trigger the Power and Speed Gears simultaneously, giving him a heavy advantage in combat. Speed Gear, Speed Gear, Speed Gear! – This tip bears repeating, as Mega Man’s new time-slowing Speed Gear works wonders on this stage. 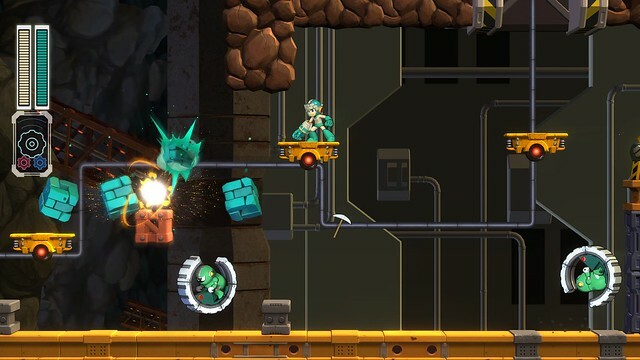 The Conveyor Belt Block Maze of Death – Block Man’s stage features a couple of sections where Mega Man walks onto a conveyor belt that feeds him backwards towards a spinning tower of blades. Meanwhile, huge block mazes fall from the ceiling on to the conveyor belt, forcing Mega Man to break his way through to escape instant destruction. Use the Mega Buster to blast cracked blocks out of the way and navigate through the openings that are created, and use the slide ability (Down + Jump) to squeeze through some of the smaller gaps. 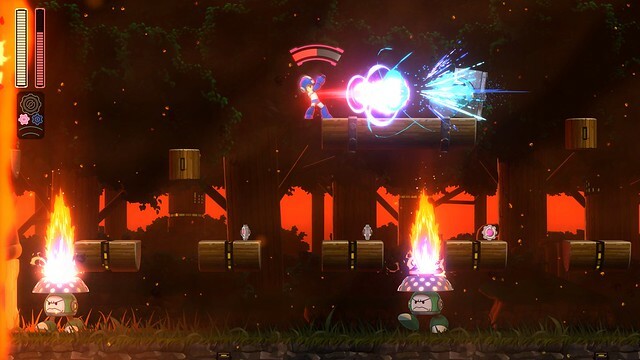 Mid-Boss Battle Tactics – Just like the classic games, Mega Man 11 is packed with memorable mid-bosses, and you’ll face off with a tower of power in Block Man’s stage. This four-story pillar is covered with spikes, so try to dodge them when it flings its segments across the room. Use the Speed Gear to slow the boss down and find safe spots to stand more easily. 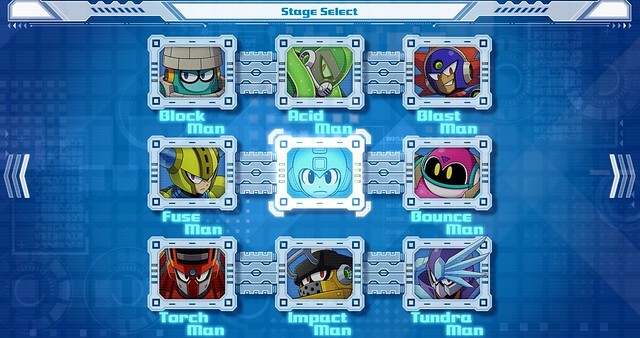 Block Man Transformed – Reaching the boss in any Mega Man stage is an achievement in and of itself, so make sure to congratulate yourself whenever you reach those iconic hallway shutters. Part way into the battle with Block Man, he will go berserk and use his own Power Gear to transform into a giant robo-golem. Unleash charged shots into his glowing red weak spot, and avoid taking damage by studying behavioral cues for his punch, slap, and rock toss attacks. These tips – along with your own determination and skill – will help you defeat Block Man’s stage and acquire his Block Dropper ability. This nifty weapon allows Mega Man to drop a ton of blocks on the heads of foes (try powering it up with the Power Gear! ), and will offer a huge advantage in the rest of the stages. Now sit back and ponder at the Stage Select screen, thinking hard about which Robot Master might be weak against Block Dropper. 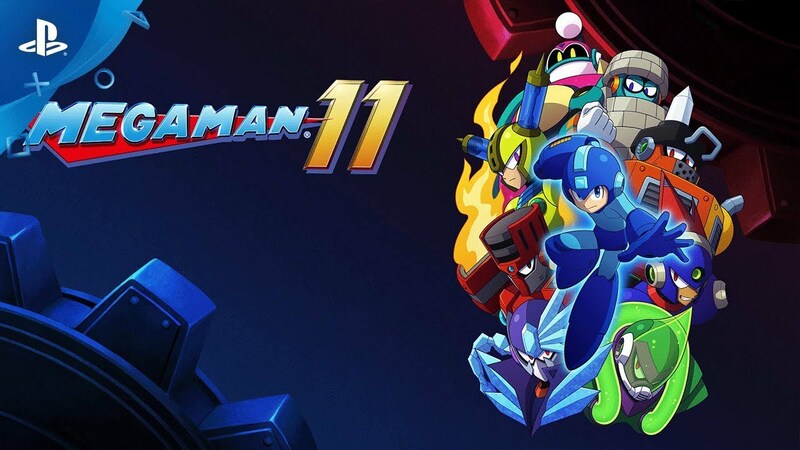 Defeat all eight bosses, master the Double Gear system, and stop Dr. Wily in Mega Man 11 – available now for $29.99! Can’t wait! Hopefully you guys do the same with mega man x! Hope you like the game! What’s your favorite Mega Man X game, by the way? Awww – c’mon figuring out the order yourself is half the fun. But I will neither confirm nor deny the accuracy of this strategy. Let me ask – why do you like to start with Blast Man? Can’t wait to play this and I would also love it if the mega man X series makes a comeback. Original X and X4 are so good. I thoroughly enjoyed MM11 from start to finish & toasted Wily, too! Give my thanks to the people who worked on it, even Koji Oda. He took the reins very well. Really loved the inclusion of midbosses in each stage, but I’m not keen on fighting them more than once. A little more complexity would’ve worked. Give them their own health gauges and battle tracks. Liked the latest Wily Castle, but I expected each stage to have their own track and a new boss, along with a health increase. Really expected hi-res illustrations of enemies & bosses, too. Overall, I had a blast. Thanks! I have these words for another Mega Man game, go Hi-Bit. There’s still this, include the opening and middle stages in the next Mega Man game, with their own midbosses, too. Those were a great inclusion in any Mega Man game, even the Classic series. I expected to hear the “All Stage Clear” track once I cleared the game. Bit bummed. Too bad Bass & Treble didn’t show up. He’d put up quite a fight with Mega Man with Wily’s Double Gear System. Hope he shows up next time. For later Robot Master rematches, include a “Rematch Remix” track that plays through all battles until the last one is destroyed. That would be great. Keep up the great work, especially the midbosses in each stage! They still need importance and attention. Roll gives you a workable boss order in the opening cutscene.